Returning on my last ‘minimal code’ blog post, I promised to get back on this to see how this works in practice. One of my question marks I added to the post was that I wondered why the Yeoman boilerplate was using run instead of RequestContext where run passed a context parameter as opposed to the RequestContext where actively a context is requested before accessing the Word object model. I think I found an answer to that, but will save this to a later date as I first want to make sure the minimal code I provided would work and I found some issues in the original posted code that didn’t seem to be correct. 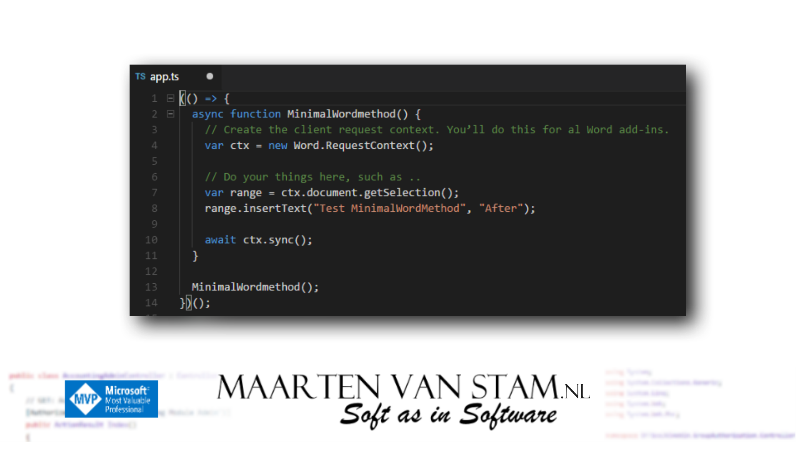 If you go back to the Yeoman project instructions in this post (and fixed the certificate issues in post Office Development – Fixing Trusted Authority – Word Client and https://maartenvanstam.wordpress.com/2017/08/07/office-development-fixing-certificate-issue-with-openssl-certificate/) you should already have a working Word Add-in. Open the project folder (or if you already deleted it quickly create a new one following my instructions from my earlier blogposts) and open the file app.ts in the src source folder. Replace all the code from this file with the code above, save it and start your Add-in ‘server’ by running npm start in the root of your project. Very simple and basic code, but there are some drawbacks you need to keep in mind. For instance, because things are async, how do you know what the right order is how things are processed. 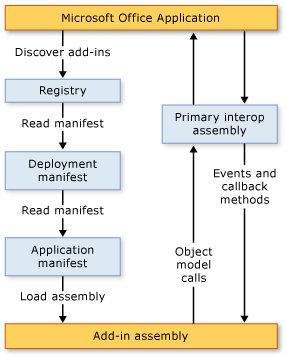 And what about batch processing of boatloads of instructions? Will this all be handled correctly, and what if there are dependencies between the batched instructions? All of these questions arise when looking at this little piece of code, and we need to address all of that in later posts. 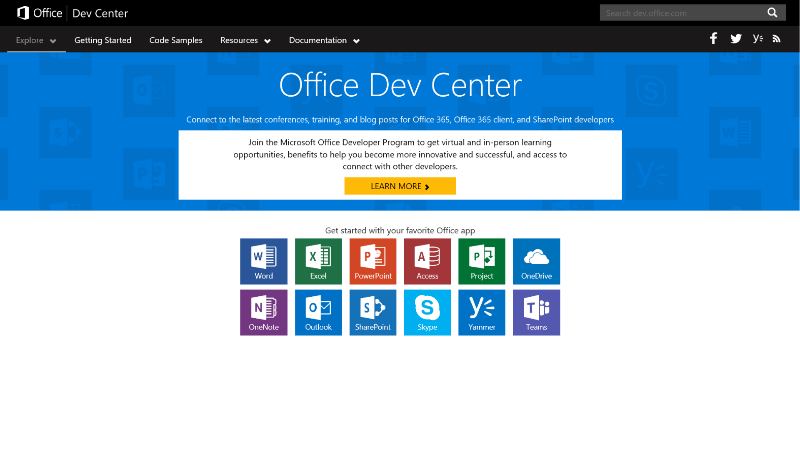 Office Development – Add-in Types, what did we have before? 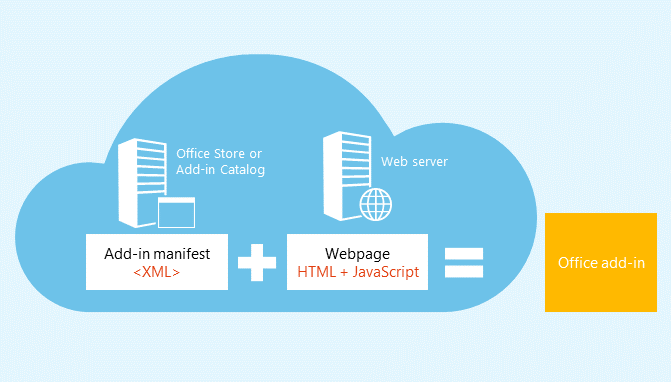 To research the ‘new’ Office JS Add-ins we need to know what types of add-ins there are. If you come from VSTO there is some similarity, add-ins can be divided in different types. Let’s see what we had before. This is the pane on the right of a document that allows you to interact with the document. 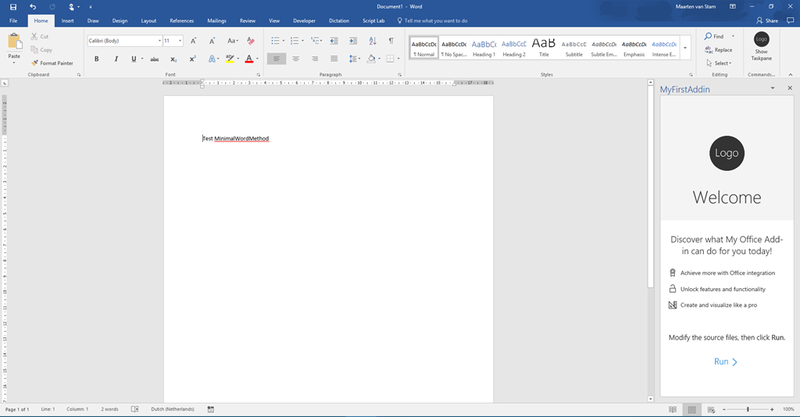 In case of an Actions Pane this is attached to the document, while the Task Pane can be there independent of the document. They can both do arbitrary things, but the Actions Pane only appears with the document. Adding your own Ribbon with controls on it. VSTO can add almost every Ribbon Control available. Outlook Form Regions extend the way you work with your mail. There are options to just add a small part on top of the mail item or take over the full real estate. You can specify when this happens, will it be only in compose or read mode? You decide. With this feature you can enhance the document with extra controls on top of the document surface. The controls are not always persistent and you may need to re-create the controls each time you open the document if you want them to appear again. These are the context menus. Right click on the document and add extra function call options within the right-click-menu to allow the user to do specific tasks related to the position of the caret (insertion point where the cursor resides). This is quite a lot of functionality and also keep in mind that from most of these features you can do the craziest things because you can extend the Task Panes/Action Panes with either Windows Forms but also XAML interfaces. The other features can use the full .NET Framework stack so you can do everything you want. The challenge is now to see if we can get the same things with Office JS Add-ins. Obviously you don’t want to fall back into a limited feature set. On the other hand, there is the fact that it needs to run on multiple platforms. That can be a limiting factor. Given this summary I now have a goal to what to look for in the ‘new’ world. 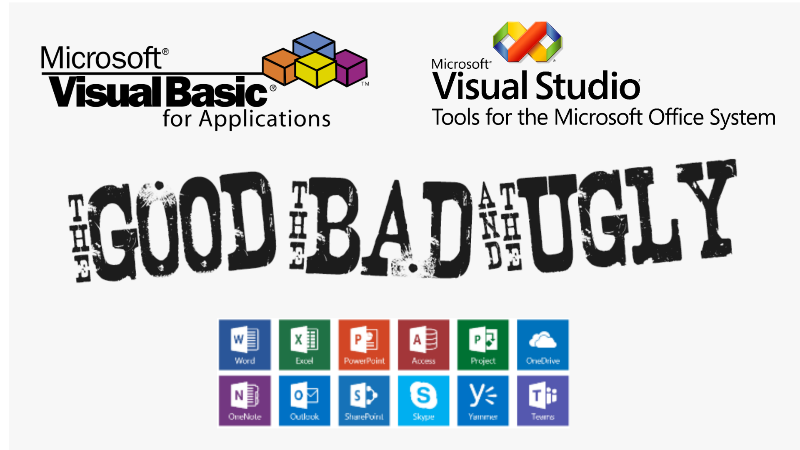 So after a small introduction to the “Ugly” VBA, the “Bad” VSTO, we end with the “Good” … well end … I guess the end is just the start of a new experience of an Office Development platform not familiar to most people. It is not included in the box like VBA, not using the languages most Microsoft developers are familiar with. This is most likely not all, with Office emerging on other platforms like Android and Linux distributions these options will be on the shortlist as well. We will research these options on a later time. The architecture is a little bit different than the other technologies, although you can debate that the Office Add-ins mechanism looks like the way it was done with VSTO. If you look at the API you will see that you recognize a lot of your ‘old’ Office Object Model. Some are close to what they were, others needed to be adjusted and there are also new options. Ok, the starter is here … in my next posts I will pick each of the items and look at the details. As I said earlier, this for me is probably like you a learning experience. I’ve been looking at it for years now in a helicopter/management overview but I decided I need to learn the ins and outs of the new platform. While doing so I try to teach you as well by blogging about it. Trying to keep it simple and getting more complex over time. Let’s see if Office Add-ins are really the “Good” as advertised and can they do the same as we can do with VSTO add-ins…. Visual Studio Tools for Office (VSTO) is a set of development tools available in the form of a Visual Studio add-in (project templates) and a runtime that allows Microsoft Office 2003 and later versions of Office applications to host the .NET Framework Common Language Runtime (CLR) to expose their functionality via .NET. As we have seen in my previous blog post Office Development – The Ugly the first option to build your Office extensions using Visual Basic for Applications (VBA) did not win the beauty contest. A very powerful toolset to create beautiful and especially productive customizations. I’m sure that VBA, the tools to set Office to your hand, allowing you to tailor Office in a way that it perfectly fits the needs of your company, is one of the main reasons that made Office such a popular box of applications. It was however risky – a potential security risk and code management is a pain. In the real world it happened that a ‘new’ version was rolled into production where all the sudden existing features ‘disappeared’ as a result of the developer picking the ‘wrong file’ containing an older version of the solution and continued developing features using the incomplete version. This needed to change … in the meantime managed code -.NET- appeared at the horizon and the next option at least had to be a) secure and b) needed an improved source control option. 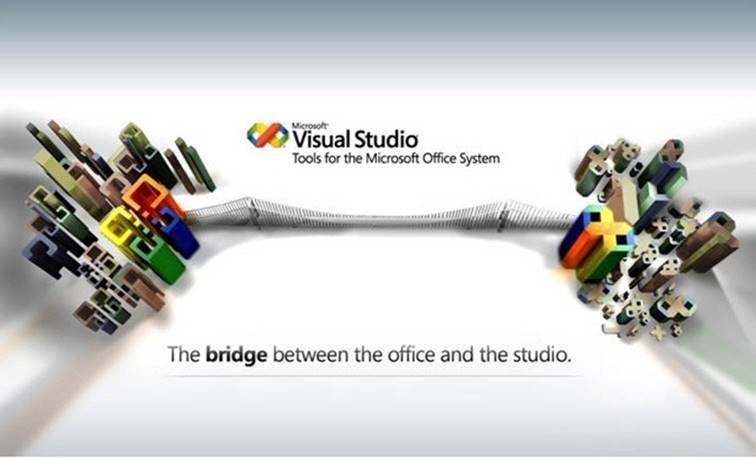 Microsoft Visual Studio Tools for the Microsoft Office System. So how is VSTO different compared to VBA? Applications, add-ins or document customizations, are built using Visual Studio. Initially in a separate Visual Studio .NET 2003 VSTO SKU and after a few version inserted in the Visual Studio 2008 box. The code no longer lived in the documents or other Office files, but from now on lived in an external assembly that would be triggered by the Office host application if the right properties were available in the document. Loading the assembly was done in a relative complex manner and it was made sure that security wise the pain seen with VBA would not exist with VSTO add-ins. As you can see the Office Application is looking at the Registry to see what add-ins are installed, if found any the Deployment manifest (pointed to by the Registry) is read and following that the Application manifest is read and the assembly loaded. This part made VSTO the “Bad” in The Good, The Bad and The Ugly … it appeared to be a real pain for the IT Pros at the time. 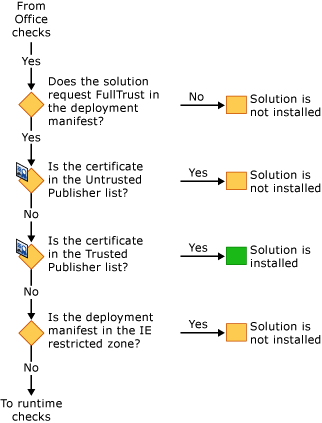 By default, VSTO used Click-Once to install the extension on the machine and a lot went wrong … certificates expired, not added to the Trusted Publisher lists, etc. etc. There was another option, to install an add-in using an .msi installer but the average VBA developer had a hard time getting around all of this, jumping all the hoops to make it work. Not at all! By using managed code, C# or VB.NET – whatever your preference was, your world of Office completely opened. Whatever you could do with .NET (and that is basically everything) you could add to your solution. Calling third party libraries, UI components, later even XAML UI interfaces, sky is the limit. For me personally this is still my fav option to build Office customizations. I wasn’t awarded nine-year Visual Studio Tools for the Microsoft Office System MVP – I guess the longest MVP title as well, without reason. VSTO controlled my life for the large part of these years (hopefully my wife is not reading this ) did a lot of forum support in this area and built VSTO applications for large enterprise companies. At the time, we still had on Microsoft campus Software Design Review meetings to share feedback and we gave the team a hard time to make sure they released the features that we really needed. And this is where we will dive in soon. It’s a relative new world, although development already started years ago, so there is a lot to learn there. Let’s see if we can do the same with OfficeJS as we can do with VSTO – but now on multiple platforms and several clients. Maybe I will return to VBA and VSTO in separate blog posts just for fun. There is just a ton of information to share on all off these areas. Oh, and if you really want to know the ins and outs of VSTO I really recommend you reading the VSTO bibles by Eric Carter and Eric Lippert: Visual Studio Tools for Office 2007: VSTO for Excel, Word and Outlook. It is a huge and heavy piece of reference with over a thousand pages of inside information. Office Development–The Good, The Bad and The Ugly? In my last post we’ve seen that there are just a whole list of options covered under Office Development. Just to get a starting point we start to focus on Office add-ins –without the capital A– first. With Office add-ins I mean Office add-ins in general, that is … from the early start to where we are today. I know that these days the name Office Add-ins is considered to be the part where Office Add-ins are built using the OfficeJS APIs but in the early years you had Office add-ins in many forms and technologies. 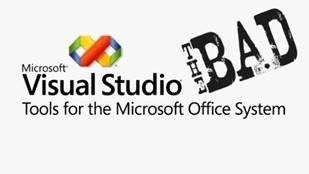 Initially the only option to customize Office was by adding code using Microsoft’s Visual Basic for Applications (VBA). This was, or should I say is – it still exists and you can still use it, the embedded code engine running a subset of the full Visual Basic command set capable in addressing the Office Object Model to quickly build some Office automation functions to make life as an Office Worker easier. The language appeared to be very powerful and in the real world people built some crazy complex stuff with it. To add more structure to building Office add-ins a new development paradigm was developed. Still using the Office Object Model but this time using the managed languages such as VB.NET or C Sharp (C#). Managing code with VBA could be a pain in the … Code traveled with the documents and when the document was copied another ‘branch’ was created and you would never know you were working on the latest version unless you managed your distributions very strictly. Also the declaration of variables wasn’t always enforced causing all sorts of runtime errors to surface just after releasing the production code. By using this new way to build your Office add-ins or customizations (I will return on customizations vs. add-ins later in a separate blog post, that’s a story on itself) with the new tools: Microsoft’s “Visual Studio Tools for the Microsoft Office System” (VSTO) at least you had a better control over your source code and you could even use Source Control to keep track of your code versions. With this, the first versions of VSTO, seemed to be very hard when it came to installing the add-ins. Security was improved a lot, but that came at the high price of tough installation issues. In these days, deploying add-ins can’t be limited to the Windows Platform so another change was rising … these are the add-ins built using the combination of well known web technologies and by including a Manifest you are now able to run your Office Add-ins (with the capital A) on all platforms in all supported and still growing number of client applications. 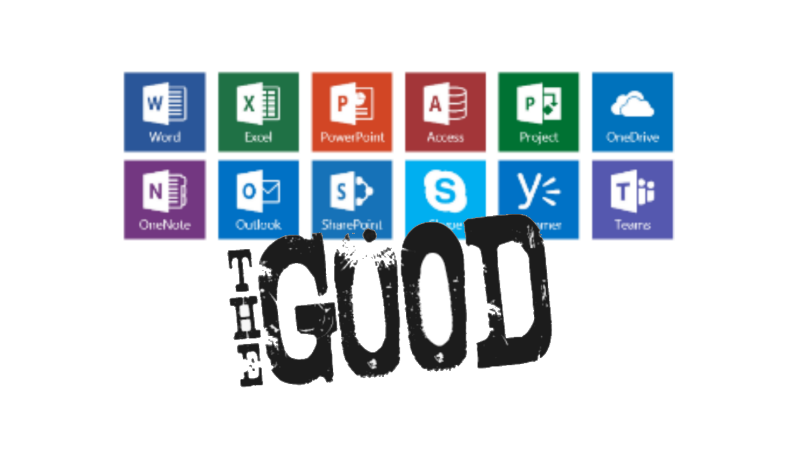 Currently the client applications are Excel, Outlook, PowerPoint, Word and recently added Project, Access and OneNote. Are these three technologies really The Good, The Bad and The Ugly? Well no, obviously not, you can still build add-ins in all three of these technologies but VBA for instance always had a very bad name, also caused by virus developers using this technology to harm innocent computer users by exploiting the technology to take over the computer and in worst case disable it. VSTO was considered to be a real improvement but this technology also had his downsides. Deployment could be really hard, but this improved in later versions. Still going multi platform was no option for VSTO. 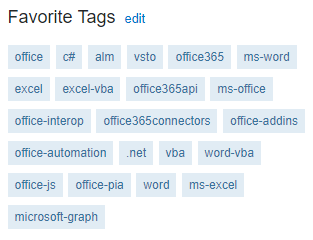 So is all good with the OfficeJS add-ins? Again, not at all … for starters these technologies used here are in general very hard to understand when you come from the VBA or managed code languages. Also, the APIs are not fully completed. It still isn’t possible to do all the things that you could do with VSTO. With VSTO there is not really a limit. Whatever you can do with managed code you can do with VSTO as it just is interfacing between Office and .NET. This of course in itself could be very dangerous and should be managed to the max. Also VSTO is used by shady guys building malicious code. 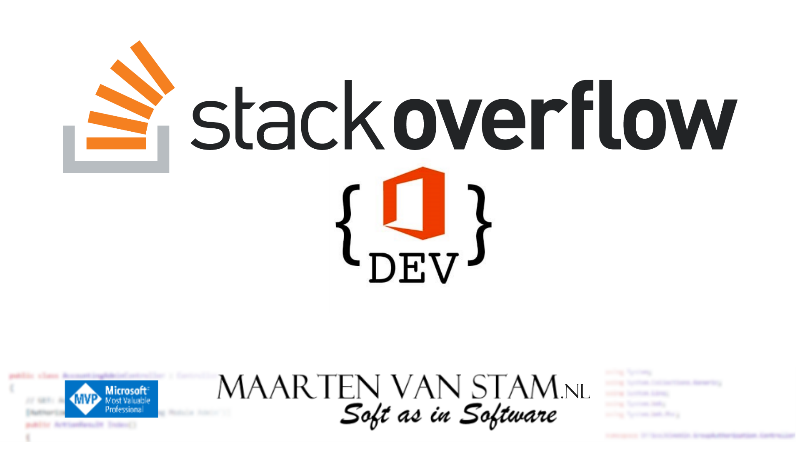 We will get more in detail (we are still diving in, going deeper and deeper at this time) in my following blog posts so subscribe and join me in this adventure called Office Development! After many years of Office Development, starting with Excel Functions, VBA, COM (VSTA/VSTO) it is time to dive in and see how things are in done in 2017. What are your options, is it still possible to do things in VBA or doesn’t it exist anymore? In my upcoming blog posts I want to look at the options available and look at the Office Platform in general. What clients are there these days and on what platform do they run. The world changed a lot in the last decade and Microsoft Windows is not the only platform anymore. There is iOS, Android, MacOS, Windows … even Linux distributions are growing in popularity. Even if you just look at it in the online (web) world many of the ‘old’ clients are now available in an Online version. Think of Word Online or Excel Online where you get your editor or spreadsheet application running in a browser application. Again, not so easy as you might think … browser applications should be running in a wide variety of browsers. Do they run in Internet Explorer, Chrome, Safari, Opera etc. etc. My goal with these Office Development blogposts is also maybe a bit selfish … coming from the ‘old’ (as you might discover) VSTO world, or even older VBA world, I need to polish my knowledge around the current options available and I can already tell you that this ‘new’ Office Development world is huge compared to what it was as the number of clients increased dramatically with the operating systems that I mentioned above, but there is also a huge amount of mobile applications for Android, iOS and (currently not so many for) Windows Mobile. So … a big challenge. I have no idea where this ends because Office Development these days also include developing for Microsoft Graph (it was Office Graph before, but it was revamped into Microsoft Graph this year, growing bigger than it already was), SharePoint Framework or Office Connectors to extend your Groups or Teams. That said, stay tuned and feel free to share your comments, tips or complaints in the comments section below!